Marion Jasper Isbell was born about 1843 in Winston Co., AL. He was living in Middleton, Hardeman Co., TN when he filed for pension stating he enlisted in Co. E, 1st AL Cav. US in July 1862 and again in the fall of 1863, as Private and then as a Lieutenant. He stated he was captured and taken prisoner of war and was still being held POW when his company was discharged from service and therefore he failed to get his discharge. He stated he was wounded on two occasions to the foot, breast and shoulder. On 14 Feb 1917 he was living at Route 1, Brigg's Store in Corinth, MS and wrote the Pension Dept. again asking them to instate his pension that he had found someone to identify him. He was 74 years old at the time. In another letter he stated he was wounded in the right foot 18 Oct 1863, wounded again in left shoulder in the early part of 1864, crippling his left arm and hand. On 2 May 1917, he wrote the Pension Dept. again stating he had moved and his new address was Bay, Arkansas. It is said the youngest children were victims of a cholera outbreak while living near Bangor, AL in what is now the Blount/Cullman Co. Line. (Researched and written by Glenda McWhirter Todd, who ordered Jasper Isbell's pension records in order to determine if he did indeed serve in the 1st AL Cav. but nothing was in the records to indicate he served other than in his request for a pension.) Please advise if you have any additions or corrections. 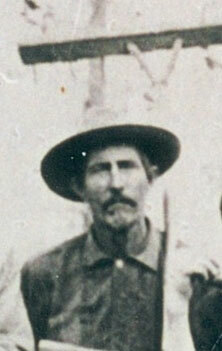 The US Pension Department was unable to locate any records showing Marion Jasper Isbell served in the 1st AL Cav. US and apparently didn't allow him to draw a pension as there was nothing in his pension records to indicate he drew one. Picture submitted by Mary Lu Nelson Johnson.